Following on from last week’s post about Langi Crossing and all that it has to offer in the way of wildlife with an emphasis on crocodiles I thought I should now expand on the birds that you may encounter during a visit! Due to the fact that we have recorded up to eighty species on any visit in recent weeks I will break them down into the larger species and then the smaller species next week. There is ample shade along the banks of the Fitzroy River to sit and enjoy the environment or go for a walk. There are no trails as such, but you can follow in the cattle tracks along the edge of the river or the gravel tracks used by vehicles. Some of the birds are more likely to be seen either early in the day or late in the day, so staying overnight will help you to maximise what you will see. In the above photo you will see several black spots and this was the arrival of Little Black Cormorants from upstream and they subsequently landed opposite where we were sitting on the bank and stayed all day. They left on dusk and returned the following day and they numbered 103! 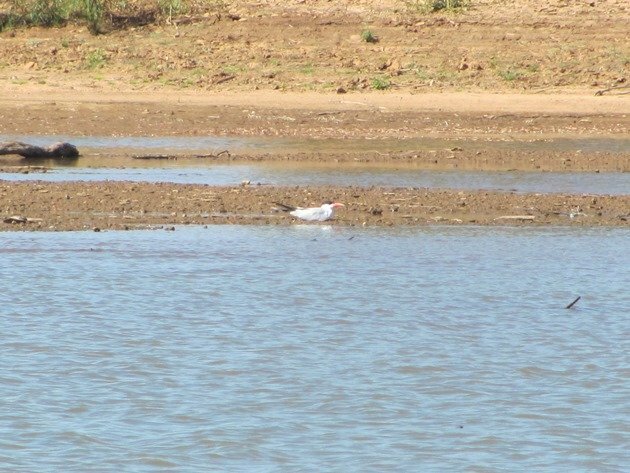 They even had a Silver Gull with them on the second day and they roosted between the crocodiles occasionally going into the river to feed and cool off. During the day we would watch Caspian Terns flying back and forth up and downstream and often a Gull-billed Tern would cruise up and down the river too. The terns would stop and roost on the sand in the middle of the river in between feeding. There was also a lone Black-winged Stilt that we would see daily going up and down stream. 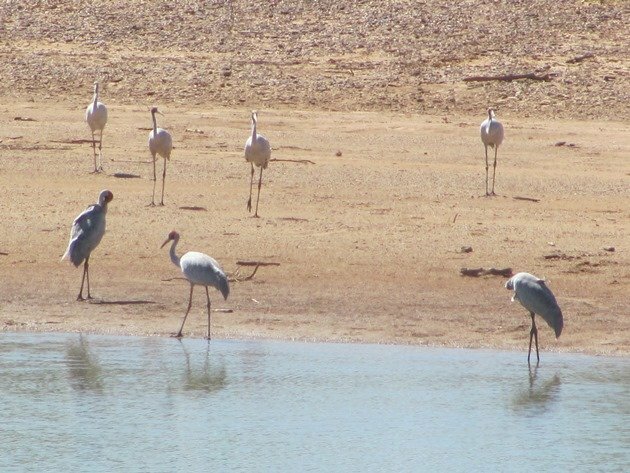 We would often hear the honking of Brolga flying overhead and then they would land beside the Fitzroy River and stop to drink and then stand in the shade. They would come down and drink at both the salty and fresh water. There was a family of Black-necked Storks that was initially a family group, but over recent weeks they have started to feed separately. The juvenile Black-necked Stork is often alone now and its parents feed together. 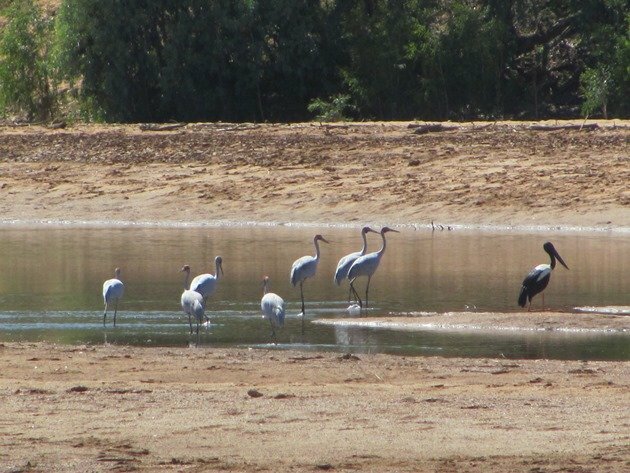 The Black-necked Storks are often among the Brolga along the river and they will “kneel” when they are not feeding! 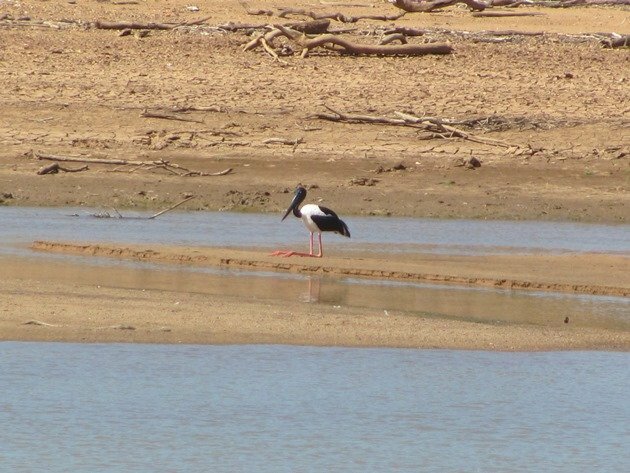 The female Black-necked Stork has a yellow eye. 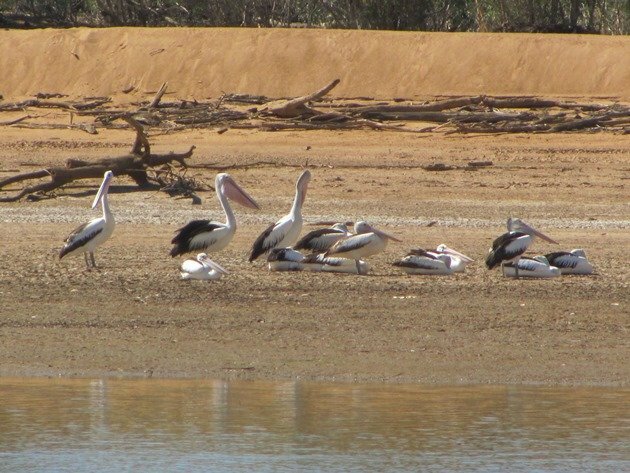 Australian Pelicans feed along the Fitzroy River and are usually in the more tidal area of the river. There are a lot of small fish visible along the edges including Pop eyed Mullet. 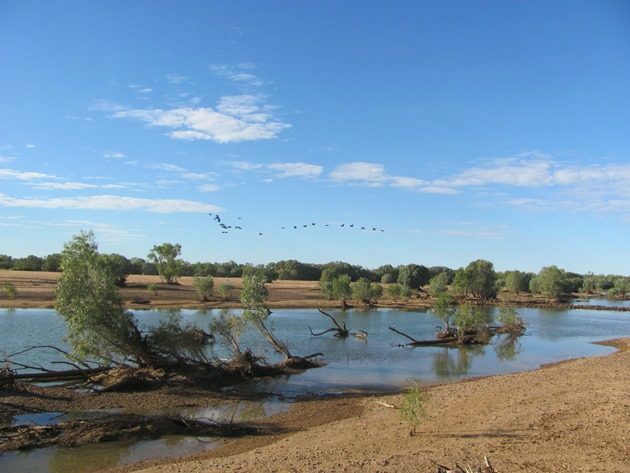 The Fitzroy River is well-known as an excellent river to try and catch barramundi and there are also sawfish present that can be in excess of three metres long. 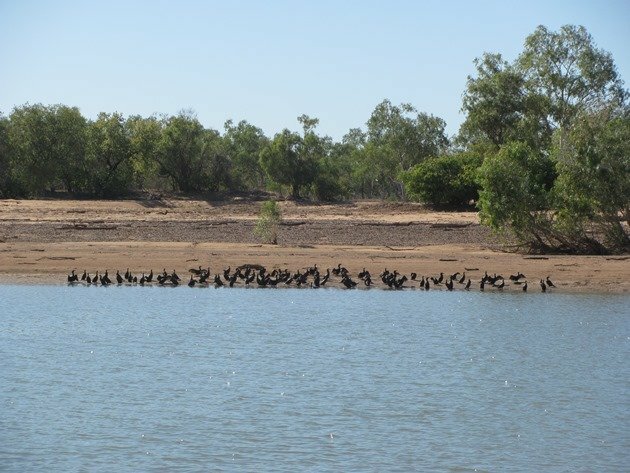 All of the logs that get washed into the Fitzroy Rover during the big rains of our Wet Season are excellent roosts for various species of birds. These include the Australasian Darter, White-faced Heron, Little Pied Cormorant and Great Egret. On dusk you hear the call of the Nankeen Night-heron as it sets off to feed along the river. The Australian White Ibis is the most common of the ibis species along the Fitzroy Rover at present, but we have also observed Straw-necked Ibis there. 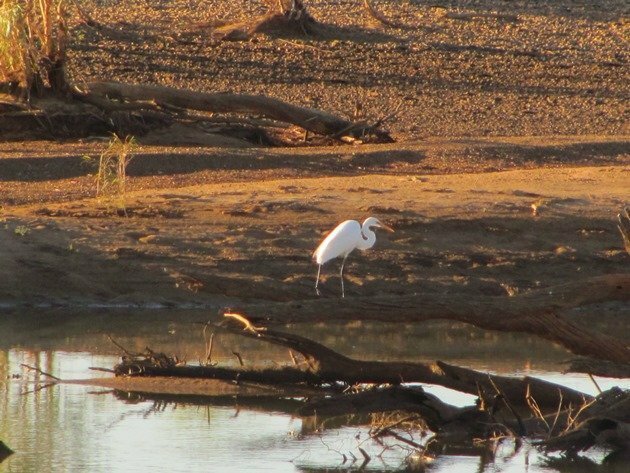 One Royal Spoonbill grabbed our attention as it flew downstream one morning too. The only ducks that we have observed on recent visits have been Pacific Black Ducks. 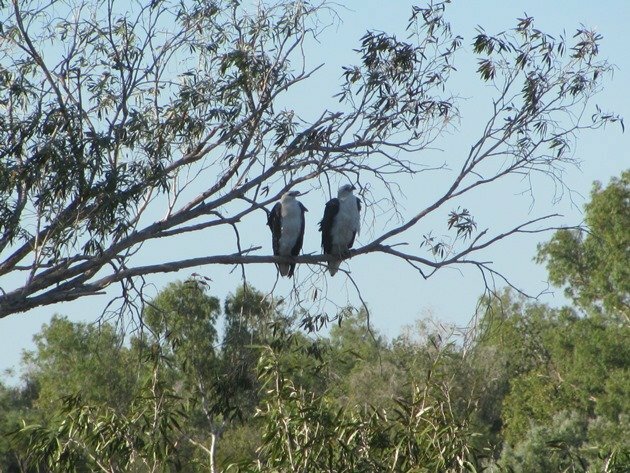 The most common birds of prey along the Fitzroy River in this area are the Whistling Kites and Black Kites, but we have also observed Black-breasted Buzzards, Brown Falcon and Brown Goshawk. Torresian Crows were present in quite large numbers in search of anything they could find that had been left by fishermen or campers. The largest birds of prey are a pair of White-bellied Sea Eagles that regularly fly up and down the river and would roost near where we were camped. A pair of Common Sandpipers arrived at the Fitzroy River mid-July and had no doubt returned from their northward migration. They fed among the crocodiles and the Black-fronted Dotterels. The late afternoons and early mornings were filled with the sound of Galahs, Red-tailed Black Cockatoos, Sulphur-crested Cockatoos and Little Corellas. Red-winged Parrots and Red-collared Lorikeets appeared to be constantly on the move. We only ever observed Cockatiels early in the morning when they came into drink briefly from the river and then move on. Budgerigars flew through occasionally too, but were less reliable to time! 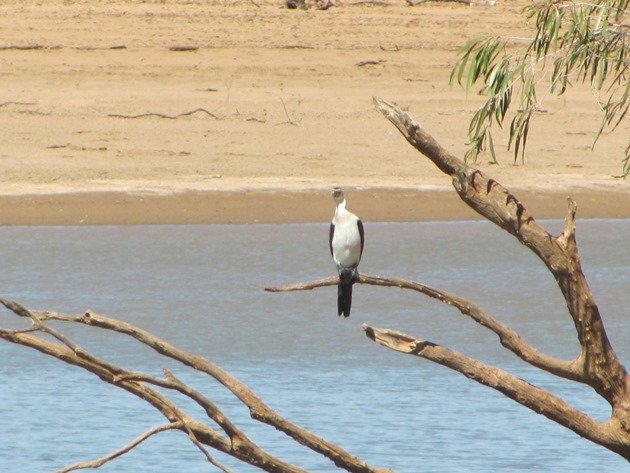 Next week I will tell you about the smaller bird species that we have encountered along the banks of the Fitzroy River at Langi Crossing in recent weeks.